The Horsefield Tortoise is one of the most popular tortoise to keep as a pet. Most tortoises are too big to live outside of their normal habitat. At maturity, the Horsefield Tortoise is generally between 16 and 20 cm. Taken care of properly, these small tortoises can live between 50 and 60 years. Still, tortoises are fragile creatures to care for. Even smaller ones need a lot of space to live. These reptiles require just the right environmental conditions to thrive. If you are going to raise a Horsefield Tortoise, you must consider the proper housing, hibernation, diet and health to ensure a happy existence for your hard-shelled friend. The Horsefield Tortoise is indigenous to Central Asia, specifically, Afghanistan, Pakistan, Uzbekistan, the steppes of Russia, India, Iran and parts of China. Tortoises do better with both indoor and outdoor housing. These creatures are active and should have plenty of room to move about. Vivariums are not an ideal living space. These aquarium-like structures are much too confining for a tortoise. The Horsefield needs a minimum of 3 square metres of living space. Young hatchlings can live well in a Tortoise Table. These structures are well-ventilated and provide ample room for the tortoise. Some owners find that putting large tubs together with holes connecting them to provide entertainment for the tortoise. Whatever the enclosure, it should be well-ventilated with holes and covered with chicken-wire on top. The structures should have a substrate to cover the bottom. It is important that it is well draining whether indoors or outdoors. Coconut coir is sold in pet stores and can be mixed with play sand so it will not become too moist. Organic bark chips are good but must not contain toxins. The bottom should not become too dry, however, so it can be misted with water if necessary. The optimal temperature for the tortoise’s housing is 21° C. Humidity should be from 60-70%. Tortoise’s need plenty of sunlight for vitamin D. That is one of the reasons that outdoor housing is smart. When indoors, a UV light and basking light should be used. The basking light should be 32-35º C. The environment should never drop below 15º C at night. The Horsefield Tortoise needs water to drink and bathe in. A large tray of water in its housing should suffice. To prevent drowning, the water should not be kept too deep. Of course it is important to clean the housing of waste regularly. The Horsefield Tortoise is indigenous to Central Asia, specifically Afghanistan, Pakistan, Uzbekistan, the Steppes of Russia, India, Iran and parts of China. These regions have extreme temperature differences. The summers are hot and dry while the winters can be very cold. In their native environment, the tortoises will brumate (hibernate) in winter and Aestivate during the summer. Just as mammals that hibernate in the winter, tortoises will slow down their metabolism, eat less and sleep during cold months. To acclimate to the hot environments, the tortoises bury themselves in the sand to avoid the heat of the sun and so they do not dehydrate. Whether you choose to allow your Horsefield Tortoise to hibernate is up to you. In their native habitat, they hibernate up to 8 months of the year. Although, they do not need to in a more temperate environment, it may still be beneficial to allow them to hibernate and aestivate for a short period of time. Before beginning hibernation, the tortoise should be checked by a veterinarian to be sure it is healthy. The environment should be kept between 4-10º C. Tortoises lose an average of just 1% body weight when hibernating. The weight can be checked by gently removing the tortoise to weigh. To wake the tortoise from hibernation, move the housing to a warmer location. The tortoise will need water right away but will not be ready to eat for a few days. Tortoises are grazers. Given room to roam, they can cover a lot of ground and eat a variety of vegetation. The Horsehair Tortoise is a herbivore. It does not eat any meat but subsists on a wide variety of leafy plants and some vegetables. Some pet stores sell food for tortoises, but it is healthier and less expensive to provide your tortoise with a diet of a variety of leafy plants chopped up. Tortoises do not eat a lot. Your tortoise will typically eat only 5-6 times a week. The amount of food for one serving can be assessed by seeing how much the tortoise will eat during a 20-30 minute period. To thrive, tortoises need plenty of calcium, fiber and minerals. They do not need to eat foods with phosphorous, protein or fat. The bulk of their diet is weeds and flowers. They like dandelions, flowers, timothy hay, stinging nettle, mulberry leaves, rose petals, leaves and many other weeds. They can eat vegetables such as lettuce and cucumbers. The more variety, the better their health. Because they require a lot of calcium (think about it, the shell is most of their body weight), they should receive calcium supplements. These can be purchased in a pet store and sprinkled on the food. Horefield Tortoises do not eat meat (phosphorous and protein) or fruit which can cause gastric problems. Although the Horsefield Tortoise lives for many decades, when captive, many factors go into keeping it healthy. Housing with the proper amount of space, temperature and humidity level are vital. 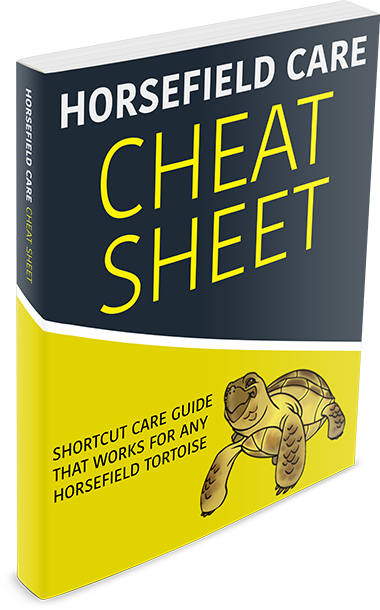 A good diet will prevent many common health defects that occur in the Horsefield Tortoise. The Hexamita parva parasite commonly infects the tortoise. It causes dehydration and sudden weight loss. It affects the kidney and urinary systems and, left untreated, leads to kidney failure. Veterinarians treat the infection with an oral medication called Methronidazole. Another common health problem is pyramiding of the shell. This is caused by a poor diet and lack of calcium and vitamin D.
The Horsefield Tortoise makes a wonderful pet. This docile creature is amazing to observe. Although it does not expend much energy it does need ample space to move about when in captivity. The environment needs to be just right in order for the tortoise to thrive. Caring for the tortoise is relatively easy. Its diet consists mainly of food that can be grown or picked. It does not eat often and if kept in a hospitable environment, the Horsefield Tortoise will make a healthy and happy pet.